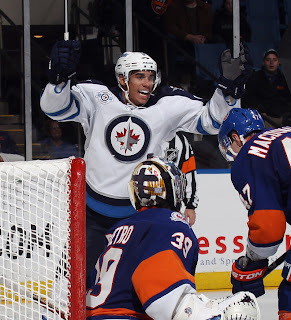 The Jets major concern this off-season is resigning two top RFAs: Ondrej Pavelec and Evander Kane. It's not a question of whether the Winnipeg Jets can sign their restricted free agents this off-season, but rather a question of if the negotiations are ongoing and productive. Not nearly two weeks removed from the Los Angeles Kings Stanley Cup crowning and the Jets and their general manager Kevin Cheveldayoff find themselves in mucky waters when it comes to some of the restricted free agents. Most notably two RFAs - Evander Kane and Ondrej Pavelec - are the two whom rumours and myths abound to which jersey they are going to wear next winter. However, Cheveldayoff and the Jets brass have a deadline to meet as July 1st is coming quickly. Let's sort out the restricted free agent market for the hometown Jets. The Jets only 30 goal scorer was Kane in 2011-12. First and most important, let's sort out the Evander Kane RFA story. Kane, coming off his first 30 goal season in the NHL, finally showed some of the potential that made him the fourth overall pick in 2009. He reached career highs in goals (30), assists (27), and points (57), along with a +11 rating and 53 penalty minutes. The fact that Kane only produced 69 points in his first 139 games in Atlanta, then posting 57 points in his 74 games this season in Winnipeg shows he has finally reached a spot where he can be a big game player. However, his first season in Winnipeg was not all rainbows and unicorns. Kane was rumoured to be a continual pest at some night club scenes across the city and was rumoured to have sustained a concussion by getting into a bar fight that had him out for a string of games in early January. 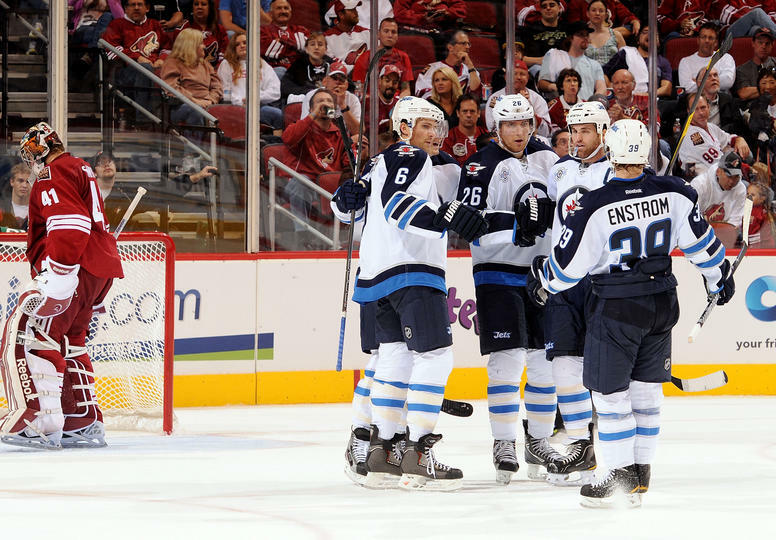 Despite the rumours or truths that abounded about Kane's social life in Winnipeg, the Jets are still keen and committed to locking up their only 30 goal scorer last season to a deal this summer. Kane's size and speed are deadly for the Jets offense. For a team that had problems scoring at times and a lack of depth up front, Kane's resigning is the most important to the team's offense moving forward. On the back end, the RFA story of Ondrej Pavelec is even more complicated. In the Winnipeg Free Press yesterday, Gary Lawless reported that the set price for resigning the Jets young goalie, who will turn 25 in August. According to Lawless, the KHL offer is slated for one year at a rate above the $5 million mark. 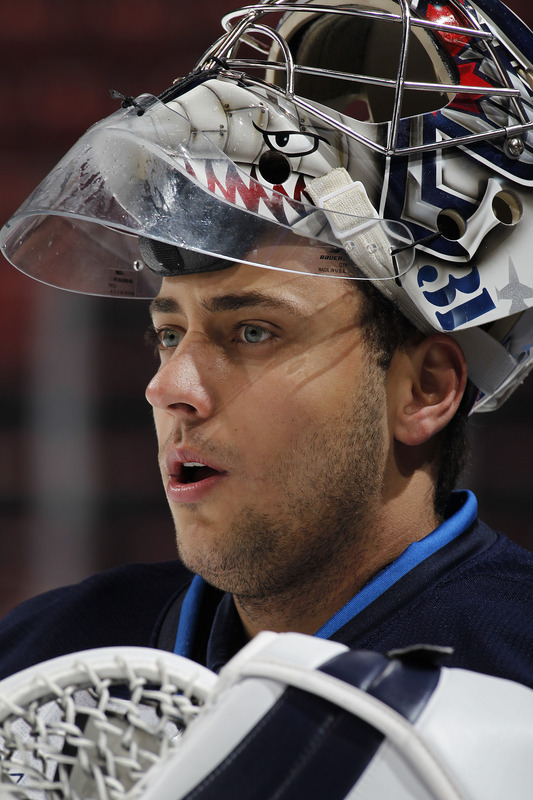 For Pavelec, the range was for a four-year deal in the $4 million range. Pavelec assumed the starters role in 2011-12. The rumours of Pavelec's apparent departure to the Kontinental Hockey League has raged all month long and continues to be the hottest topic for Jets fans and reporters as Pavelec's future with the Jets may be muddier than at first suspected. His 2011-12 season was a career season in many regards, including games played (68), wins (29), saves (1845), and minutes played (3932). His 29-28-9 record is - at best - a mediocre record. Compared statswise to other goalies in the NHL from the past season and Pavelec - the Jets MVP - does not stacked up well at all. Pavelec ranked 66th in goals against average with his extremely high 2.91 goals against - which put him rankwise behind many backup goalies including Mathieu Garon (2.85), Ray Emery (2.81), Josh Harding (2.62), Jason LaBarbera (2.54), and Martin Biron (2.46) just to name a few. 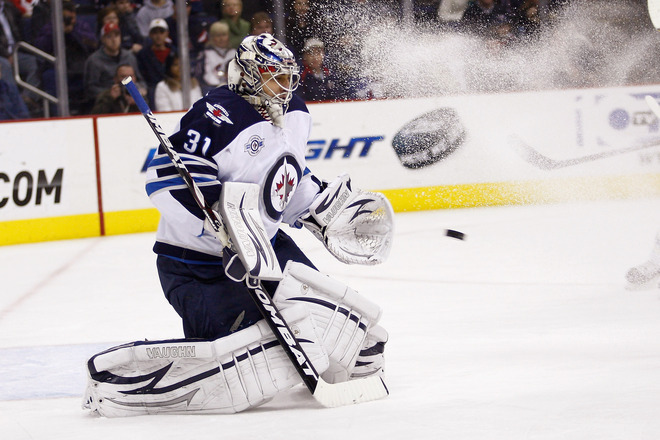 Is Pavelec then the goalie the Jets want in their net? Granted, it is Pavelec's first full season as the unrivalled number one goalie in an NHL crease. But for the Jets to sign him and make it worth it, Pavelec has to show he can improve his technique - which at times was sporadic and unorthodox - and his numbers consequently. After the big two free agents slip off the market, the RFA pool is downplayed a bit more. Eric Fehr, who was acquired in a trade from the Washington Capitals last summer, was projected to be the hometown hero, who would be the 20 goal scorer on a second or third line. Fehr's season, however, was tumultuous and sporadic and he never stuck in the lineup for any long period of time. In 35 games this season, Fehr notched only two goals and one assist a far cry from his 39 points (21 goals, 18 assists) two seasons ago in Washington. Injuries hampered his season and the poor performance he did put in this season has put a definite hamper on his return to the Jets lineup. If Fehr is re-signed (which is highly unlikely) it will be to battle for a spot and for an NHL veteran of 265 NHL games, he would rather test the market. Two other players who made their way in and out of the lineup this season included Ben Maxwell and Spencer Machacek. Maxwell was traded halfway through the season before being picked back up by the Jets via waivers late in the season. Originally traded to the Thrashers as part of the Brent Sopel deal in 2011, Maxwell dressed in nine games for the Jets, collecting one goal and adding four assists with a plus three rating. His prowess for being a playmaker in part of seasons in the the AHL with the Hamilton Bulldogs and more recently St. John's Ice Caps have earned him a right to compete for a job in Winnipeg. Maxwell will likely be given at least a qualifying offer as the Jets will see if he can continue his gradual development after being a second round pick in 2006. Spencer Machacek showed promise in limited time. As for Machacek, a third round pick in 2007, he found himself adorned to Jets fans late in the season with his high intensity play and his nose for the net. In only 13 games with the Jets - primarily in a checking role - Machacek netted two goals and aided on seven along with seven penalty minutes and a plus eight rating. Machacek's development has been gradual, which is a surprise in the former Atlanta system. He has played in over 60 games in the AHL the past four seasons and has always collected 48 points or more. He is a no-brainer to lock up for the Jets. Two more no-brainers to lock up are defensemen Paul Postma and Arturs Kulda. Kulda, who brilliantly filled in on defense in the early part of the season, has nine games in a Jets jersey under him, which included a plus three rating. A seventh round pick in 2006, his style is more to the liking of a defensive defenseman with a good first pass and a smooth skating style. His 20 points in 63 games in St. John's this season show he is well capable of mixing in some offense time and again. Paul Postma continues to develop well in the AHL. As for offensive defensemen, Postma may have been a steal in the 2007 draft as he was the 205th pick in the seventh round as well. His consistent progress to becoming an regular NHL defenseman took greater strides this season as he put up 44 points in 56 games in St. John's and dressed in three games (albeit much time spent on the bench) for the Jets. His 2011-12 pre-season was also a good sign of things to come as he acquainted himself with Jets fans early alongside 2011 pick Mark Scheifele. The Jets are extremely deep on defense, and Kulda and Postma are a big part of the Jets future on the blueline. Others who had a strong showing in St. John's this past season include Maxime Macinauer, who was acquired in the trade for Maxwell, and defenseman Brett Festerling. Macinauer played in 29 games for the Anaheim Ducks before the trade to the Jets and spent much of his time in St. John's as a checking centre not figuring in on the scoring much. As for Festerling, he was a rock on the Ice Caps blueline. In 50 games, he netted 18 points (three goals, 15 assists) and was a plus eight. He also suited up for five games as a Jet early in the season, posting a minus one rating. As for Festerling and Macinauer's resigning, it goes along the same paths as the other remaining restricted free agents - it all depends on the Jets need for development. If there are spots that need to be opened for the likes of a Zach Yuen, Mark Scheifele, or an Ivan Telegin this coming season in St. John's, then the Jets may opt to not resign them. John Negrin was acquired from the Calgary Flames organization later in the season and played in 14 games for the Ice Caps collecting three assists, but did not suit up in the playoffs. A former third round pick in 2007, Negrin has only three games of NHL experience. Michael Forney bounced between the Ice Caps, the ECHL's Colorado Eagles and was eventually loaned to the Texas Stars of the AHL for the remainder of the season. In 53 games with the Eagles, Forney had 51 points (20 goals 31 assists) but with the Stars only two points in 11 games and no points in three games in St. John's. Fredrik Pettersson returned to Swededn in 2011-12 after spending the 2010-11 season with the Chicago Wolves scoring 32 points (11 goals, 21 assists) in 67 games. A fifth round pick of the Edmonton Oilers in 2005, Pettersson just finished his season in Sweden with Vastra Frolunda HC of the Swedish Elite League posting 40 points (16 goals, 24 assists) in 54 games along with an incredible plus 26 rating.